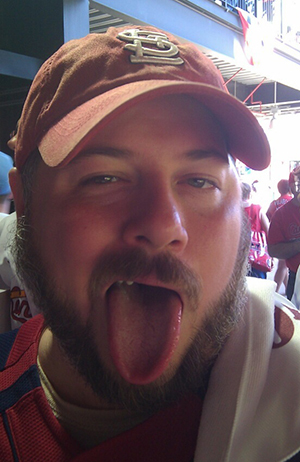 In 2011 at Busch Stadium, during a Cardinals playoff game. I swear I have those teeth in the middle. If you would like to contact me regarding anything on tdylf.com, please do so at theblogyourelookingfor@gmail.com. My name is John LaRue, and I am a graphic designer/production editor/print purchaser/data visualization geek. In my spare time, I like to watch a boatload of movies and television, and write about all of it here. I live in St. Louis, Missouri, which is the provel cheese capital of the world. That’s primarily because nobody else in their right mind throughout the world would eat the stuff. The only way to answer “Where are you from?” is by saying that I was raised mostly in Madison, Wisconsin, by my Missouri-native parents. And that means that I have very strong roots both in Madison, Wisconsin and also throughout the state of Missouri. I have previously worked for five years in professional baseball–two of those as an intern–as a Media Relations Director. It goes without saying that I’m also a huge baseball geek and diehard fan of the St. Louis Cardinals. At TDYLF, I have recently shifted my focus to data visualization (infographics!) and general design. If you’ll pardon an obnoxious listing of my achievements, my work here has been featured on io9, Grantland, movies.com, Wired, Slate.com, /Film, and the Toronto Star. I was also featured on the now-defunct IMDb Hit List 21 times. My work has been published in I Love Charts: The Book and The Best American Infographics 2013. I also cover movies, TV, and try to make readers laugh as much as I can. Ingmar Bergman and Buster Keaton are my yin and yang. I also enjoy French films (nearly every aspect of them), horror films, premium cable TV (especially Breaking Bad), Edgar Wright, Martin Scorsese, Louis Malle, the Czech New Wave, John Huston, Billy Wilder, Martin Scorsese, Akira Kurosawa, Preston Sturges, Alfred Hitchcock, Joel and Ethan Coen, Mel Brooks, François Truffaut, Jean-Luc Godard, Fritz Lang, Michael Powell/Emeric Pressburger, Sam Peckinpah, Jacques Tati, Quentin Tarantino… this list could continue forever. I like a lot of filmmakers and TV shows. Flowchart: Which Horror Movie Should You Be Watching? I have enjoyed your insane website so much, I decided to feature it on a blog I do called Spanning the Whirled. The idea of my site is to feature cool websites that I find either impressive or frightening. In your case, it fit both categories. Maybe I need to change my masthead to reflect the “Impressive, but frightening” moniker. You’re from the US right? That’s correct. I live in St. Louis, Missouri- the midwest United States. I am going to add The Droid You’re Looking For to the Blogroll at Anti-Film School. I have become a huge fan of your site and I am consistently blown away by the creativity on display here. Here’s to more posts that have me doubled over in laughter and marveling at your wit! Thank you so much, Steve! And likewise, I’ve been meaning to add you to mine. Consider it done. would you mind if i tag you in my post? i know, this isn’t very cool and it’s my first time to be tagged and do some tagging as well, hehe, but i thought i should ask. please, say yes…^^ the tag will come with a short description of the site and why i visit it often. Hello. It’s not a bother at all! Please feel free to tag me. I’m honored. Holy Christ! Keith Spillet what a photo! I came for the stick figures and stayed for the photos. Anybody notice how close the words photos and potatoes are? Just stopping by to let you know i’ve bestowed upon you the honour of the One Lovely Blog Award. Good work, really enjoying reading your posts! It’s a little different, but definitely the same vein. Thank you again! I actually think someone nominated me for the 7×7 thing at some point, yeah it is essentially a variation on a theme. And no problem at all, i think your blogs are excellent! The Director’s rollcall and the titbit about obscure lists/quizzes, had me hooked. 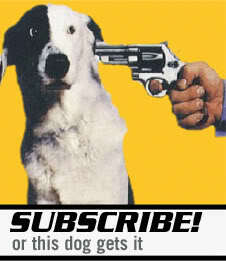 Saw your comment on Curnblog (where you mentioned even smaller films). I’ll check it out. Thanks for coming by! My name is Lauren Francesca, I shoot comedy videos online. I have been in many viral videos. Recently I shot a video that is topical and relevant for your site and would love for you to feature it. My videos have been seen on many popular blogs, Sports Illustrated, Entertainment Weekly, Perez Hilton etc. Love reading your site. Great blog. And long live Space Girl!